Mathew 27:45-46 From noon until three in the afternoon darkness came over all the land. 46 About three in the afternoon Jesus cried out in a loud voice, “Eli, Eli, lema sabachthani?” (which means “My God, my God, why have you forsaken me?”). 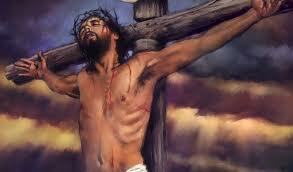 Today is what is called by Christians…Good Friday and that’s a very blessed name to call this Holy day. This is the day that my brother…God’s only Son gave His life for you and me. Without this very special day I wouldn’t be sitting here so happy in my spirit about the hope I have in my present life and my eternal future. When Jesus was hanging on that cross He said something that really sends chills up my spine when I hear it. He didn’t just say it…He yelled it loud and clear for all the world to hear. 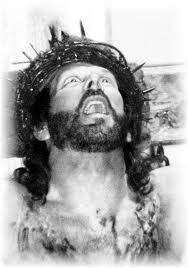 He said…“My God, my God, why have you forsaken me?” This was a prayer that Jesus prayed and He yelled it out loudly. Why did He cry this out loud? He prayed many times before and was it ever recorded that He yelled out to His Father in this way? God can read minds so Jesus didn’t even have to speak out loud. What did He want us to know? Jesus wanted us to know something very special…that this was a really big sacrifice that He made for us. The pain of having His Father turn His back on Him because He could not look upon the sin that Jesus bore on Himself for us… was very very heartbreaking. He was yelling from the deepest anguish from His heart. For Jesus to yell this way in the condition that He was in… must have meant that this was something very powerful that He wanted us to remember. I’m getting teary eyed just writing this. I believe Jesus was yelling…”I LOVE YOU SO MUCH!”…to each and every one of us. At the end of all His many hours of suffering He spoke His final and very powerful words…”It is finished.” Why do you think He want us to know that? What was the “it” that He was talking about? The “it” was the…putting us right with God! Jesus started His work on earth and this was the day that His work was finished and He wanted us to know this. Spiritually…because of His extreme Holiness… God had His back to us because of our sin…there was a separation between us and God…but Jesus took our sin on Himself and used His own shed blood…to make it so God can look upon us in a different light…accept us into His family…be our friend and be our God. The original sin was removed from our lives when we repented and believed in His Son. Jesus turned God’s shoulders around so that He could look upon us and pull us to His bosom and hug us and say…my child! 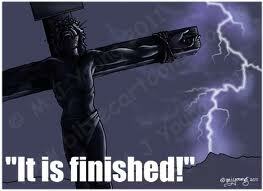 All of this was possible because of Jesus and this is why Good Friday is sooooo good. As you reflect in your own personal way this day…I hope Jesus sacrifice of love will be remembered in your hearts and minds today and…everyday. Message for today: Good Friday is Great Friday! Thank you so much Jesus!…Thank you so very much! Tanya, thank you so much for this beautiful post! Our Saviour is so, so wonderful, so loving and He gave so much for us. How great a love He has for us that He would allow Himself to be nailed to a cross, suffer so horrible a physical pain and then to suffer the most horrendous mental pain of having His Father turn His back on Him because Jesus carried our sins on HImself. Such a great love is almost beyond imagining and the only reason I can imagine it is because I know in my heart and soul that Jesus Christ did and does love us this much. Thank you my precious Saviour! Great love…that’s why He did it…Great LOVE! Thank you Lord! I thank God for all He has done for us Through His Son Jesus Christ. Thank you for blessing the World with such a living and Powerful display of Your love for each and everyone of us. God bless you Tanya for this Post. Thank you Jesus! God bless you my sister!